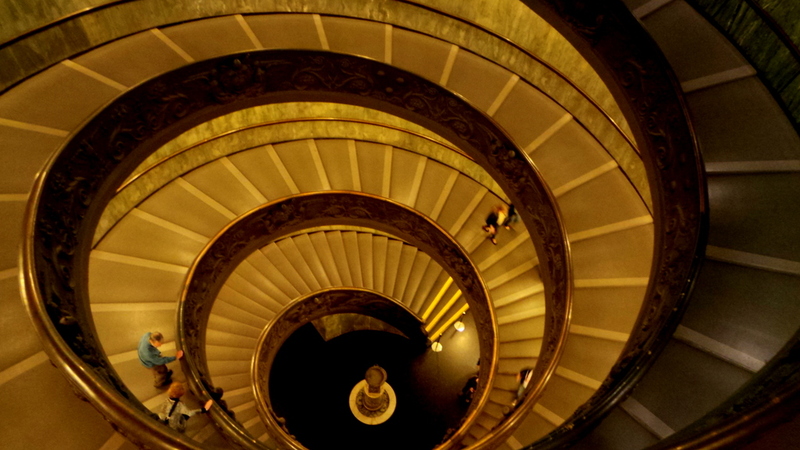 Why Should You Visit the Vatican After Hours? Despite this, I still wanted to see the Vatican whilst in Italy for myself. I knew there had to be a smarter way of doing this. So when Walks of Italy offered for me to go on their Vatican After Hours: Museums & Sistine Chapel at Night tour, I found myself saying “Amen”. One doesn’t need to be Catholic or any specific religion to have reason to visit the Vatican. But if you went to a Catholic all-girls school, and was named after a nun AND a Pope, skipping the Vatican would be an invitation to being burned at the stake by your devoutly Catholic mother. So on our first night in Rome, we found ourselves inside a cab trying to speed its way to our meeting place for the tour. “It’s Friday night!”, our driver proclaimed, gesturing towards the traffic ahead of us. After several surges and sudden stops , (an unpleasant sensation I have not felt in decades), we finally reached the Taverna at 19:15 on the dot. It was hard to miss our group. 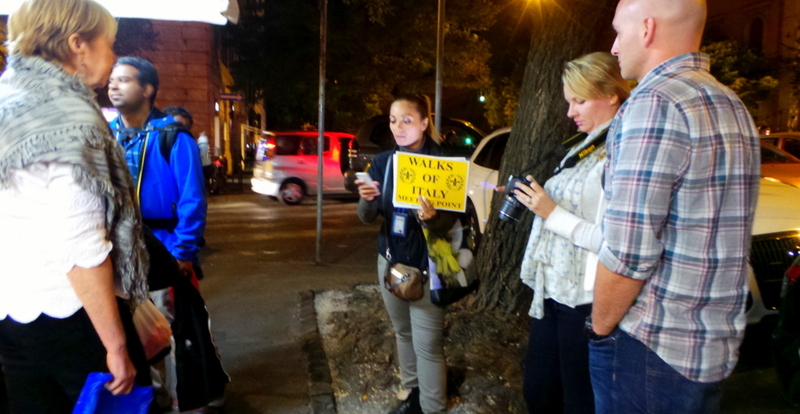 Elisa, our guide, was holding up a bright yellow Walks of Italy sign. She greeted us and said we were waiting on 2 more people. After about 10 minutes and a couple of phone calls to the company, she announced that we will start the tour without the 2. There were 10 of us in the group in total. A good mix: A family of 4 (two kids under 4) , a newlywed couple, 2 middle-aged women and us. Except for my mom and I, everyone in the group were all from the United States. Before we marched on, Elisa handed us all headphones so we can still hear her commentaries without being in close proximity. She advised us to try to stick to the group as it is still easy to get lost even if this is an after hours tour. 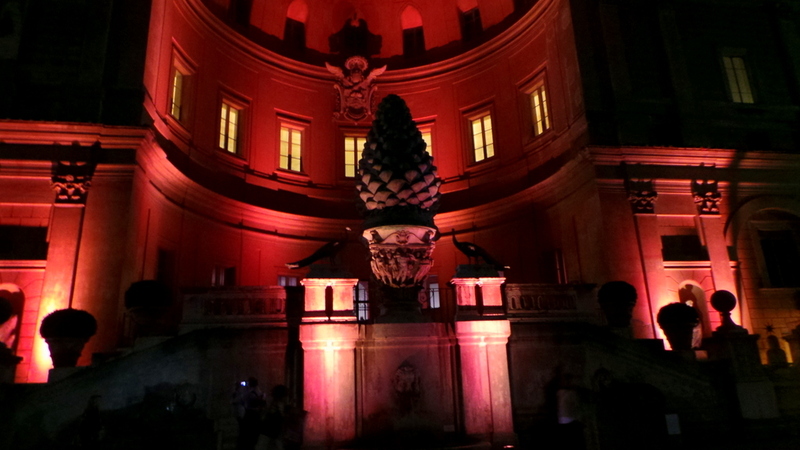 The Vatican is brightly lit at night. And even though this was an after hours tour, there still are people and other tourists around. While it’s not exactly crowded, it was still a fair number of tourists there, 99% of which seemed to belong to other tour groups. 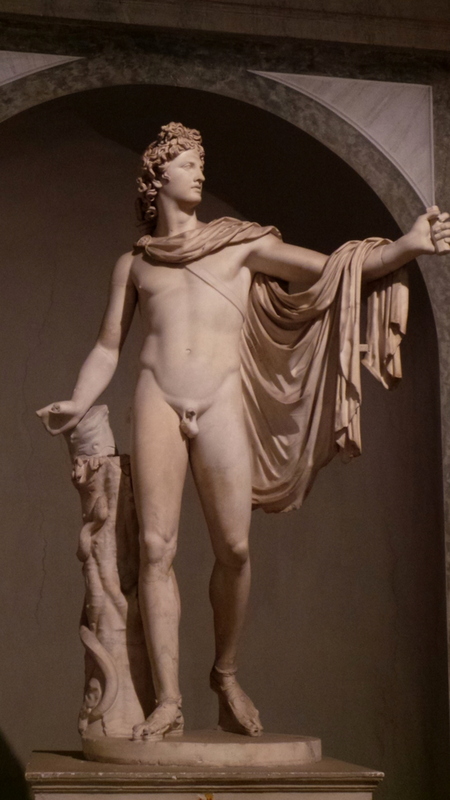 It’s remarkable to note that all my life, I’ve known these sculptures to be ivory coloured. 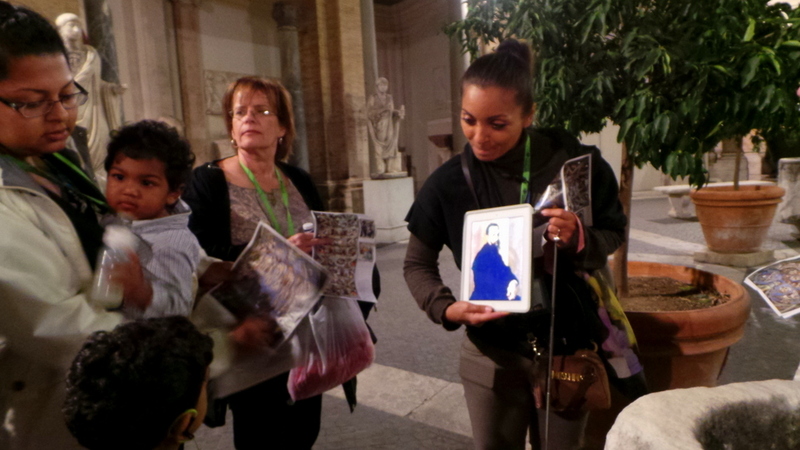 But Elisa was armed with a tablet to show us impressions of what the sculptures originally looked like. All with lifelike colours! There were dozens and dozens of other sculptures in the area. I was tempted to gaze at each one of them but it may take days if I did that. Elisa took us to a few select key sculptures and gave us abit of history and background behind them. It was great to hear Elisa explain the history in a simpler language for the child to understand, and it helped that she also had visuals to help her explain. She also had photographs of Sylvester Stallone and Vladimir Putin because there were paintings that had people as part of the subject (not the sole subject) where people looked like the exact portrait of those two personalities. “Oh yes! yeah! That’s who I was thinking of too!”, her friend chimed in. Really? I wasn’t bothered so much about the blatant interruption, but that I did not see the resemblance at all. Elisa is beautiful, and so is J.Lo of course but they don’t even look similar. Elisa must have felt the same way as she looked surprised, and joked that perhaps we can also find a painting of a woman who looks like J. Lo in the Vatican. “It must be the latin blood. Yeah, that olive skin.”, the woman persisted. I get what she meant, but if I really have to pick a latino personality that resembled our guide? It would be Salma Hayek. Back to the Vatican. 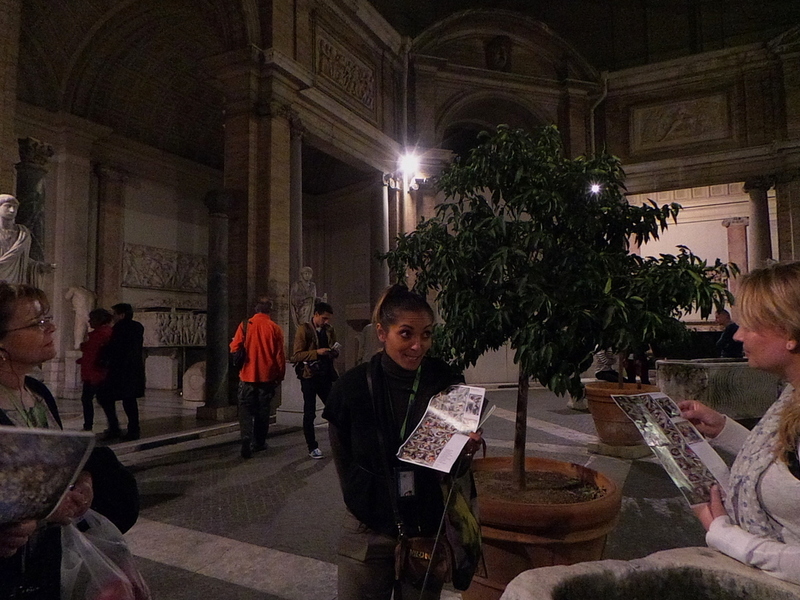 Before we entered the Sistine Chapel, Elisa handed out sheets of paper. 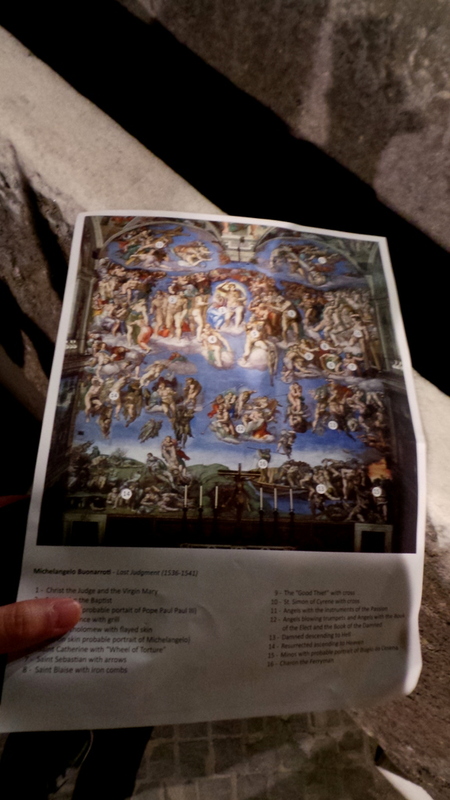 It was a diagram that showed the painting details of the Sistine Chapel’s ceiling. No talking or photography is allowed inside the chapel. So we spent about 3o minutes inside the Sistine Chapel roaming individually and regrouped again. In the beginning, I felt that the tour was rather rushed. But as we progressed, I realised that the timing and tempo of the tour was just right. 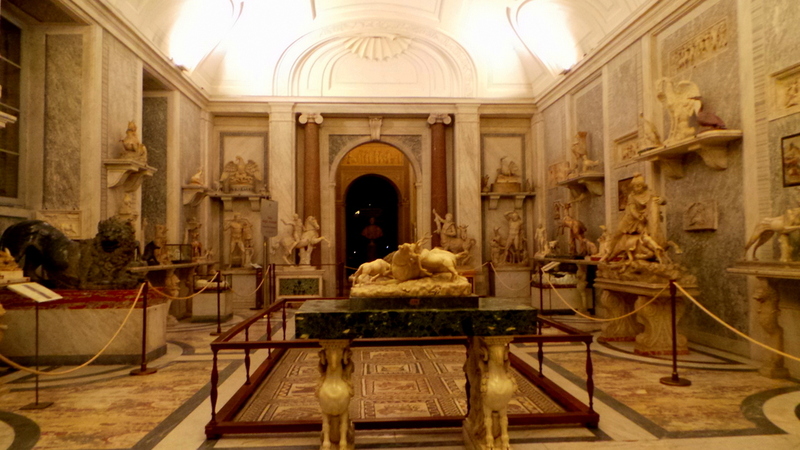 The Vatican and the museums were just too massive to be explored in great detail for a group tour. I found the halls nearing the exit of the Vatican to be the most stunning. So what are the advantages of going with a group tour when visiting the Vatican? 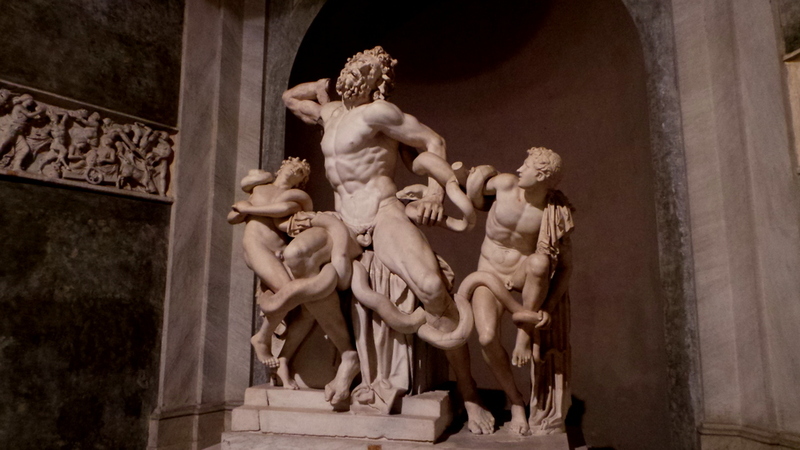 I strongly suggest you go with a group tour when visiting the Vatican. Even if you pride yourself as a ‘never-gone-with-a-group’ kind of independent traveller. Unless you have a FULL day to spare exploring and finding out the details of every area/ sculpture of the place, then by all means. 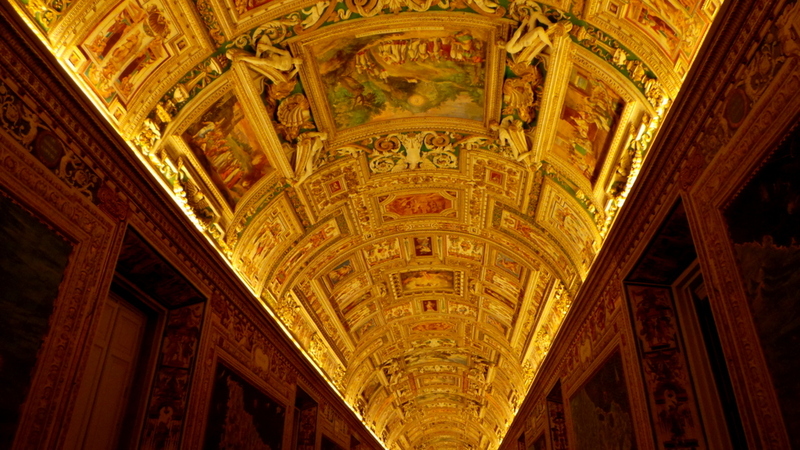 What are the advantages of going on an After Hours tour of the Vatican? It’s less crowded! It’s cooler (Rome can still be hot in the middle of the day in October), and there’s something about the way fountains, buildings and sculptures light up during the night that makes the experience extra grand. And as for me, I found spending 2.5 hours looking up at sculptures and slowly walking to the pace of the group quite tiring. So I’m glad that this happened in the evening, so I was in bed immediately after the tour and had one of the best sleeps ever! What are the cons of being in a tour group? This is a general answer that can be applied to all kinds of tours and companies. Well, for one it can feel abit rushed but this is due to making smart use of time and waiting (from time to time) for others for regrouping. But do take note that Walks of Italy also offers a private tour version of this specific tour. What are the pros of being in a tour group? You save a lof of time. You skip the lines! — a must when visiting the Vatican. Your guide will be ready to answer your questions. You can meet new people. 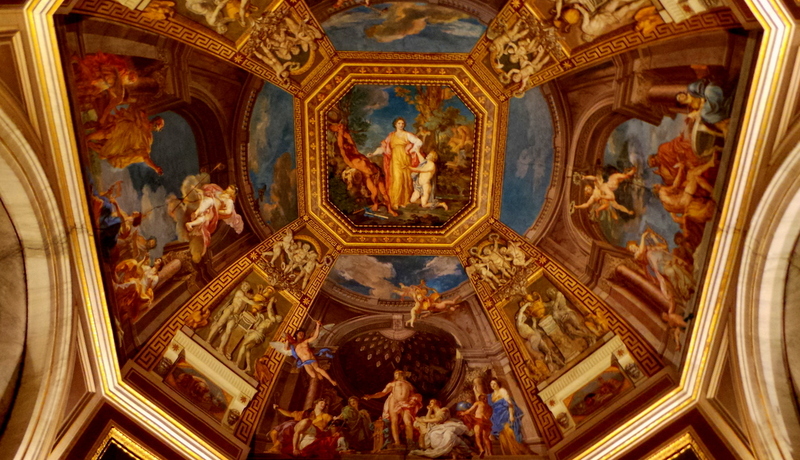 You will know where the highlights of the Vatican are quickly, rather than spending a lot of time finding it. Why go with Walks of Italy? They also own Walks of New York so the “Walks of..” company is international and growing. As this tour is walking-based, there are no hotel pick-ups. 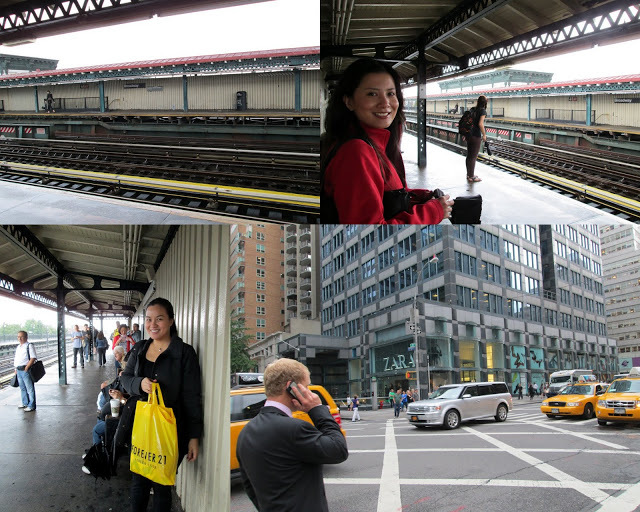 This encourages you to explore places to get to the meeting point. You also make your own way back to your hotel. This keeps the cost of the tours affordable. A special thanks to Walks of Italy for hosting us on this tour. However this does not hold any bearing on my views and opinions of this blog. I went to the Vatican years ago, but not after hours! Would love to do this!! Hey Jean, this sounds like a fabulous idea. It is 21 years since I visited the Vatican and yes it was very crowded. However this most certainly did not leave a negative view for me. My memories of visiting the place have nothing to do with the crowd. I found the Vatican a fascinating and intriguing place. There is an incredible amount to see so lots of time is vital, 2.5 hours might be tight for me personally. Oh, yes. I am a good Catholic boy, however even non-Catholics without a prejudicial mind will also appreciate visiting. Sadly my visit did not have a tour guide. This is something I should consider for the future. Yes I’ve heard some area of Italy are so crowded particularly at certain times of the year. We felt a bit overwhelmed when we visited Florence!